By now, most New Jersey homeowners have their backyard pools open and ready for summer. 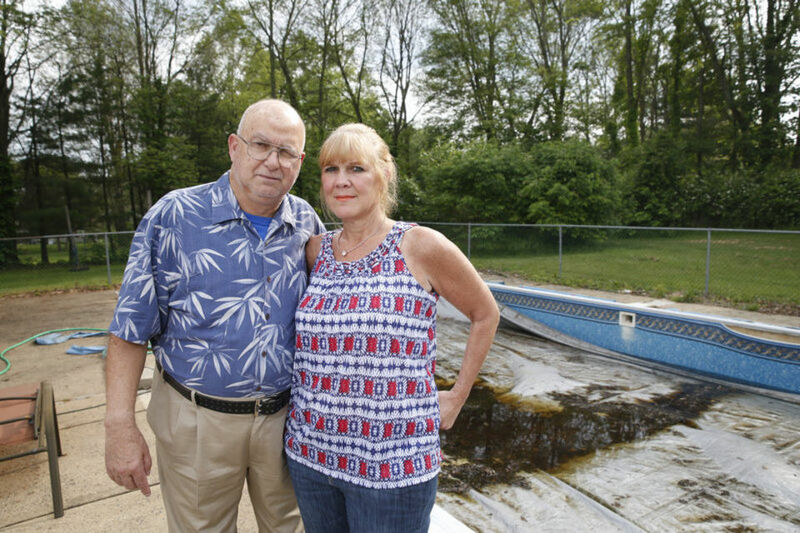 She said because of a contractor’s broken promise to refund money for an order he couldn’t fulfill, Fell has been unable to open her pool — a pool that her 75-year-old uncle absolutely loves. Fell, a single mom, is the sole caretaker of her uncle, who is disabled and lives with her in her Bound Brook home. Back in September 2014, Fell started planning for the 2015 pool season. She’s had an ongoing problem with her pool cover, which has never fit properly, and always leaves her with a filthy pool after the winter season. So at the end of last summer, Fell’s friend recommended Steve’s Pools, a company that had opened and closed the friend’s pool in the past. The owner, Stephen Porada, uses the line “Pool Service you can count on” for his business card. Before we go on, we want to make a very important distinction. The company with which Fell has a beef has a name that’s similar to two other Jersey businesses: Steve’s Pool & Spa Service in Hazlet, and Steve’s Pool Service in National Park. These two businesses are owned by different people and have no relation at all to Porada’s company, Steve’s Pools. Fell invited Porada to give her an estimate on a new hard cover for her in-ground pool. “The kind an elephant can stand on,” Fell said. Fell texted with Porada before his visit. “I want to make sure we get you exactly what you want,” Porada said in a text message before the meeting. Porada came to the home and measured the cover, giving Fell an estimate of $2,000. The two signed a contract dated Oct. 2, 2014 . It was a one-page long and handwritten on loose leaf paper, calling for a $1,000 down payment and $1,000 upon completion of the job. But Fell said the job was never completed, and the pool cover never saw her property. A complete picture of what happened was captured in a series of text messages Fell shared with Bamboozled. Five days later, Porada said he’d check in with the company to see the status of the order. It was ready on Oct. 29, Porada said by text, and he said he’d pick up the cover the next day. There was no word until Nov. 15, when Porada texted to set up an install date. That’s when Fell started to be concerned about the delays, and she shared her concern with Porada. “I am an honest person I am not going anywhere with your money you will have your cover or you will have your thousand dollars I am not a thief I would never do that,” Porada said in a punctuation-lacking text message. After that, more excuses began, Fell said. First it was traffic court. Then a death in the family. Then a new baby in the family. Then a hospital emergency. And then Porada stopped answering Fell’s texts and phone messages, Fell said. They finally spoke on Dec. 18, Fell said. Fell said she was willing to take her refund on a payment plan. She received a $100 payment on Dec. 29. She received another $100 on Jan. 23. On Feb. 26, she received a payment for $50, along with a handwritten note from Porada. Fell, not an unreasonable woman, agreed. The next payment, though, came on March 12, for $60. It also came with another note. “This is every dime I have left from last week after rent,” the note said. The paragraphs that followed again made promises of future payments, but Fell said she never received another penny. Porada did text in April, saying he had a pool job and should have more money for Fell, but no money was ever delivered. After the April exchange, Fell, said, she tried to call and text several times, but there was no answer or Porada’s voice mail box was full. Fell’s adult son tried from his phone, but also, no answer. Soon after, Fell reached out to Bamboozled. We reviewed text messages between Fell and Porada, the written notes Porada gave with his refund payments and the one-page contract signed by the parties. That contract is one huge red flag and a violation of state law. According to Consumer Affairs, any contract worth more than $500 must have specific, detailed information including the project’s price, the starting and ending dates, the scope of work, the contractor’s business name, address, and registration number, and more. The contract Fell was given lacks much of that information. We took a look further. According to Consumer Affairs, there are no complaints against Steve’s Pools or Stephen Porada, and there are no lawsuits against the company. It’s not listed with the Better Business Bureau, either. Nor does Steve’s Pools show up in any corporate filings or trade names with the state, public records show. That’s something companies must do if they want to do business in the state. We reached out to Porada to ask about the status of Fell’s refund. His voice mailbox was full, several times, so we emailed some questions to him at the email address on his business card, which is the same email that was hand printed on the contract. We wanted to hear his side, and to ask, now that it’s summer and he presumably has more income from pool jobs, if he had a plan to refund the rest of Fell’s money. So now, Fell is still waiting, and she said she will file a complaint with Consumer Affairs. She has a family member helping her get the pool ready, much to her uncle’s delight, and she’s gotten three more estimates for a new pool cover, hoping it will make next year’s pool opening a lot easier. Still, Fell wants her money back.